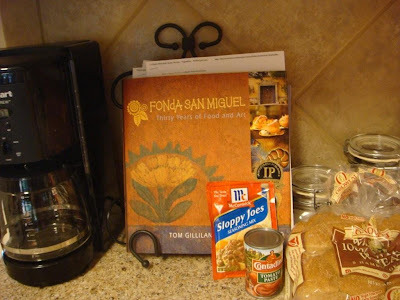 Gloria purchased a Fonda San Miguel cookbook a few months ago. Fonda San Miguel is an institution in Austin, considered one of the "finest interior Mexican restaurants in the country." Yes, I found that quote on their website, but it's true. So Gloria bought this gourmet cookbook and put it on display. Now, it's an entirely separate post about why woman would put a cookbook on display, part of their secret and possibly dangerous nature, but that's for another day. She asked me on Saturday what I wanted for dinner, and I told her, and the ingredients she bought to make the meal happened to wind up next to the cookbook on the counter.